If you just got a new Nikon flash or a new Nikon camera like the D4 or D800, maybe even a Nikon 1, there’s an app for you. If you are like me, you don’t want to carry a big manual with you everywhere you go but for those rare occasions you need to refer to it, it is nice to know that you can download the manual in pdf form from the Nikon website. 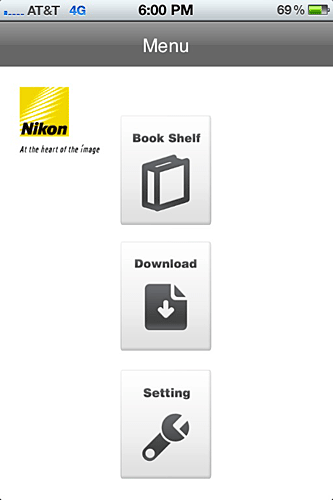 To make it simple, Nikon has a free iPhone/iPad app (not available for Android to my knowledge) called Nikon Manual Viewer – it is free and much more convenient than carrying around a manual. 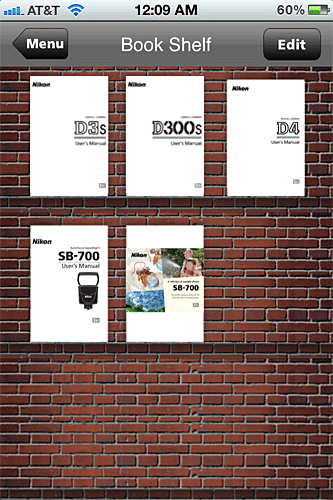 Several of Nikon’s product manuals for DSLRs, NIkon 1 and speedlights are available for download and viewing from within the app itself (currently only in English or Japanese). The app is free and easy to use, you go to the Downloads button and select your product from the menu. The app downloads the manual and places it in your bookshelf for future offline use. When you open the manual, you can go to the table of contents or index and then touch on the page you wish to visit and the app will take you there. While reading there is a way to bookmark and annotate any page that you like for quick recovery in the future. 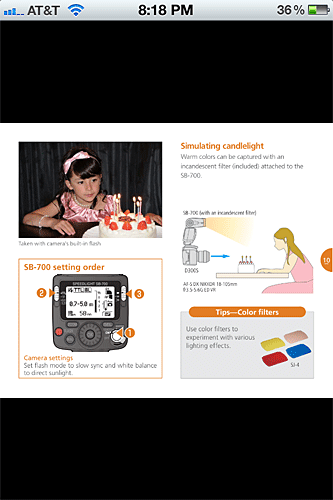 If you bought a flash such as a SB-700, you can download not only the manual but also a separate Techniques Guide, which can also be handy if you are less experienced in flash photography. 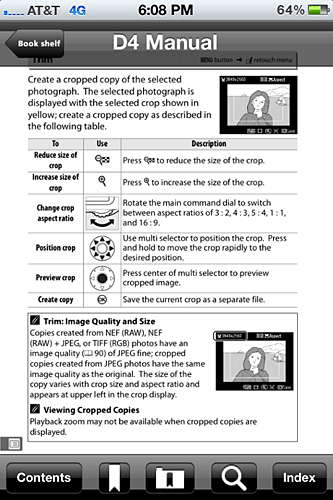 One last tip: If you have an older piece of equipment that is not available on the app for download, you can check the Nikon website for the manual and download it in pdf format and then view it in iBook or other app such as GoodReader The website has more manuals available for download than the app so check it out. Sorry Canon users, I didn’t see a similar app from Canon, if I have missed it, please feel free to correct me. Thanks Phil for the follow up. Thanks for the tip. Too bad they don’t list the SB600 in there. Why not just read the manuals as PDF files on the IPAD? Thanks Burt, yes, as mentioned in the article, you can do that. I couldn’t download it from the Apps Store. The say it is not available anymore. Antonio, thank you. That is odd, I just went and tried and it downloaded for me. I am not sure where you live, maybe it is not available if you live outside the US?? I assume you are trying to get it iTunes and not the Mac App store. It is not in the Mac App Store on the mac computer, it is in iTunes App store. No manual download option for D40 or any coolpix camera. Looking at the design and capabilities of this app, hard to believe that Nikon built it. They have a very nice app for iPhone already. Should have integrated the two and launched an iPad version. Well I am asking too much. Yes Pankaj, you are correct about the D40, older cameras are not included, at least as of now. I did edit the post after you pointed out no COOLPIX – it is only Nikon 1 – thank you. The app does work on both iPad and iPhone, if I am understanding you correctly. Unfortunately not available outside the US. That is too bad, but you can still download the manuals in pdf format and view them from a pdf reader.